January Collaborative Contest Ends in One Week! As we kicked off the New Year earlier this month, we announced a new contest hosted by the @Biomech_Collective on Instagram: The Novelty Effect. For those not familiar with @Biomech_Collective, it's an Instagram account that I run with my co-conspirator, tattooist Kurt Windish, as a resource for the entire community. Mostly it's for sharing abstract tattoo art by any artists inclined to do work of this nature, but we also occasionally host contests. The Novelty Effect is centered around the idea of creating new motifs and effects as a result of artistic collaboration, and will be judged based on factors such as how seamlessly the two artists work together and how novel or unexpected their finished piece is. 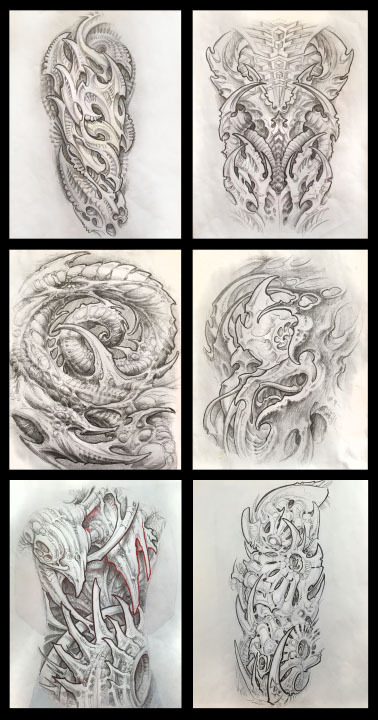 As prizes, we are giving away some original collaborative drawings that I did with other artists while working on the Biomech Encyclopedia project, which will be drawing to a close this Spring. The drawings, pictured here, were each started by another artist giving me a rough sketch to work with, which I then reprint very lightly and then draw on top of with pencil. This method is by no means the only way that collaborations can be done, but we have found that when one artist's rough shapes are then retraced in a second artist's hand, with some things being changed and others kept more or less the same, then a unique combination of styles then occurs that can only ever happen when those two artists work together. The artists that I worked with to create these drawings are (clockwise from upper left): Jason Vogt, Phil Robertson, Kurt Windish, Marco Velazquez, Thad Minnick, and Ron Earhart. Since each winning entry will have two winners that created it, prizes will be awarded in pairs. You can read more about the specifics of the prizes at www.tattooeducation.com/contest/. There's only one week left... Let's see what you can do!